Needs to tolerate a bit of shade from a growing red maple, here is a photo of the area in April and June where I want to put in the plants/flowers. 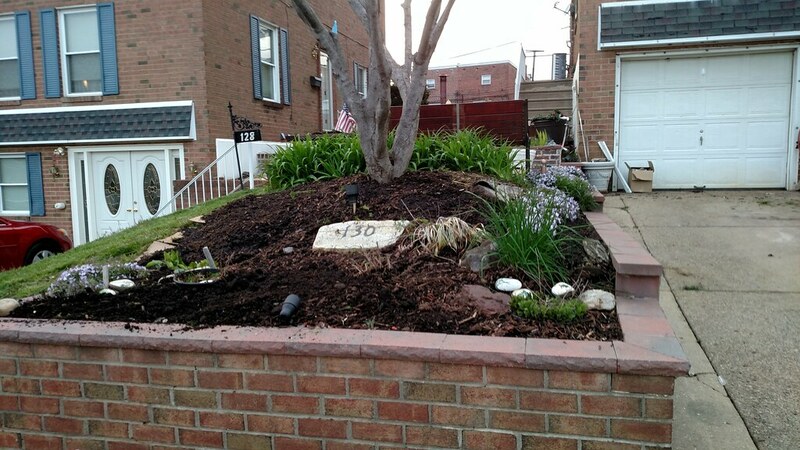 Basically everywhere you see mulch above the rock and around the tree is where I will want to put the flowers/plants. I don't want something too invasive like in the mint family but may try oregano if I cant find anything else. You can see by the July picture that I don't need to cover too much of an area. It’s a raised bed — tending to be dry? Or does the bricked wall hold moisture well? There are many. Find a good local native plants nursery and they will help you with what is best for your spot. applestar wrote: It’s a raised bed — tending to be dry? Or does the bricked wall hold moisture well? It holds moisture pretty well, plus I have drip irrigation on the hill. Would like to keep the plants no higher than 18", I want the tiger lilies in the back taller than the new plants. rainbowgardener wrote: There are many. Find a good local native plants nursery and they will help you with what is best for your spot. I will never trust another nursery again, I'll stick to advice from my forums and my own research. I'm going to research the plants you listed. 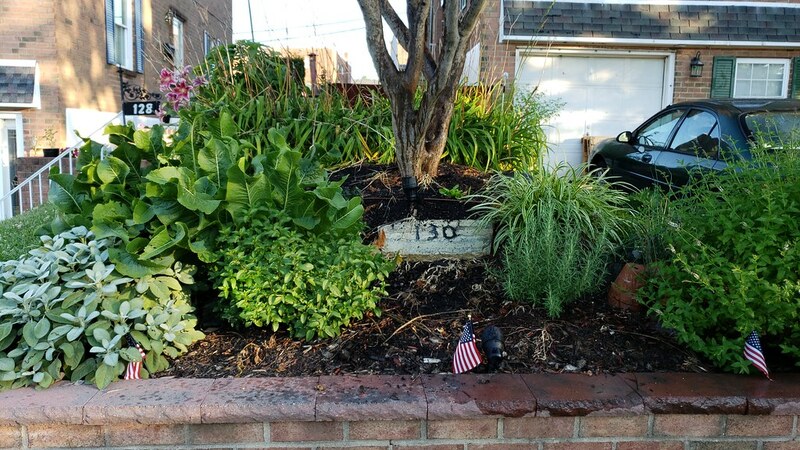 I originally wanted to put in Hostas but I felt they were a bit boring and wanted something more insect/hummingbird friendly. Here’s one I’ve been wanting to grow. Not just for flowers but for the fruits and possible uses for the leaves. I had a plant, but apparently planted it in a wrong location and lost it/it died. My problem is finding a well-drained spot. — I’ve been wanting to get one again, and your spot looks to be a pretty good fit. ...or if you prefer non-evergreen perennials, how about heuchera or tiarella? Tiarella might be too early, but they def’ly love herchera/coral bells. Heuchera would let you play with foliage colors. Also my hot pink “Coral Reef” monarda is a dwarf 12-18”H unlike “Jacob Cline” which grows to 3-4 ft. ...eta... just looked it up and they are listed as taller... hm. Maybe mine are stunted or something, but they don’t grow to 30 inches or whatever. Maybe there are other dwarf monarda cultivars. What about this one? This is not actually native to Pa. but is native to NA. There are other species of evening primroses that grow as tall as 6 feet. This is one that I had in my former “Wildflower Meadow” garden that got overwhelmed by other stuff, and possibly too wet/clay soil since the area has been turned into the Spiral Garden after the successive failure of the more dry prairie-type wildflowers. (Or maybe it couldn’t handle the really cold winter we had one year). I like that these would bloom in the evening with sweet fragrance in your front bed. You really need to check into the requirements of each and know something about your soil type (drainage and pH for sure). For example: when I was in Cincinnati, I tried to grow wintergreen several times, but it must have acid soil and it always died in my alkaline soil, no matter how I tried to amend it. Incidentally hostas besides being boring and having zero habitat value (except for slugs and deer, which both love to eat hosta), is not native (they originated in Asia).